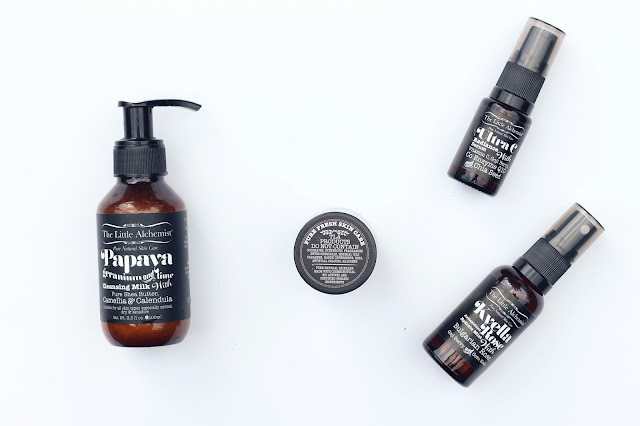 I'm so excited to share with you guys an all natural Australian brand that has become, far and away, one of my favorite green beauty discoveries. The Little Alchemist contains a collection of skin and body care products that have become integral parts of my routine, with unique and innovative ingredients that work fantastically. 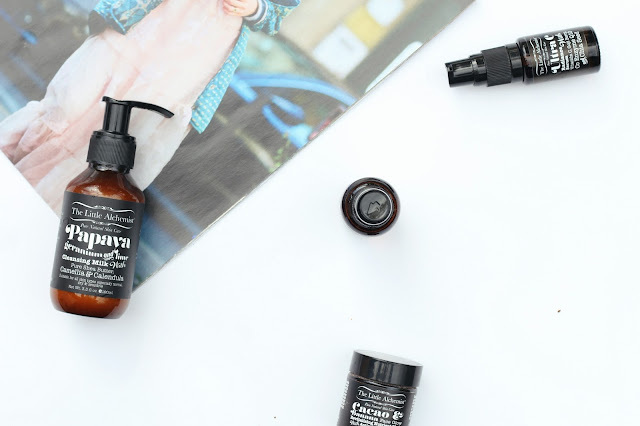 The cruelty-free brand specializes in providing concentrated amounts of natural anti-aging properties in all of their formulas, leading to some truly powerful products that deliver on their results. Oh, and if all that weren't enough, can we just talk for a minute about how darling the packaging is? Yeah, I know, not the most important part, but it's gorgeous enough that it merits and mention. Anyways I've been trialling four bestsellers from the line for about a mont now and I wanted to delve a bit into why I love each and every one so much. Let's start with the Cacao and Banana Face Glow* because y'all know I love a great face mask. This particular one is a dry formula containing a blend of fruits (papaya, banana, acai berry), turmeric, raw cacao, vitamins and clay to cleanse and exfoliate your skin. I personally mix it with a bit of water (though you can really use any liquid, honey, yogurt, etc. of your choice) and leave it on for ten minutes, removing it to reveal seriously glowing skin. I mean, with the list of ingredients that this gem has it should come as no surprise that it leaves you with a truly healthy, luminous complexion that's hard to stop looking at in the mirror. It's that good. After taking off the face mask I usually spritz a bit of the brand's Kyella Rose Antioxidant Hydrate Mist*, and all natural alcohol-free hydrating mist that contains Bulgarian rose as well as a beautiful botanical blend. This has become a favorite of mine for both prepping the skin for a facial oil/serum as well as touch ups throughout the day. It's superbly hydrating and leaves my sensitive skin looking soothed and perfected whenever I spray a bit throughout the day. It also doesn't hurt that it smells stunning. Seriously, I have to keep reminding myself it's a skincare product, not a perfume. For my nighttime routine, I'll often use The Little Alchemist's Ultra C Radiance Serum* after the hydrating mist, as the perfect start to my evening skincare. With an intensive Rosehip oil and vitamin C based formula, the ingredients for this blend of oils work to smooth fine lines, regenerate and strengthen skin as well as promote elasticity. With the ingredients list being as impressive as it is I knew before even trying this one that it was something special. It quickly absorbs into the skin, leaving it moisturized and ready to get to work. Some times I layer it underneath another product if my skin is really in need of some TLC, but it works just as fabulously on its own. As much as I adore everything I've tried, the last product I've been trying out from the line has to be my favorite. The Papaya, Geranium and Lime Cleansing Milk* is one of the most hydrating, stunning cleansers I've ever used, and it's become a must-have in my daily skincare. Shea butter, camellia seed oil, papaya and pineapple enzyme extracts are just a few of the extraordinary ingredients found in this beautiful bottle, and they combine to make a uniquely hydrating but overall purifying formula. Papaya and pineapple enzymes are natural, non-abrasive exfoliants that disintegrate dead skin cells without irritation. Combine these with the moisturizing properties of camellia seed oil and Shea butter and you've got yourself a powerful team. As someone with dry, sensitive skin this is just the type of formula that I need - it cleanses without stripping the natural oils of my skin, and exfoliates dead skin cells without irritating my complexion. Win win. I couldn't be happier with this dreamy product and I'd recommend it to any and all who have dry, sensitive skin. Have you guys tried anything from The Little Alchemist? Be sure to follow this wonderful brand on Twitter, Facebook and Instagram to keep up with all their latest!